API Technologies Corp. ("API" or the "Company"), a trusted provider of RF/microwave, microelectronics, and security solutions for critical and high-reliability applications, announced recently its new family of hermetically sealed circular connectors for aerospace applications with high differential pressure. These connectors, from API's Spectrum Control line of products, meet MIL-DTL-38999 fine leak requirements and are ideal for aerospace engine control, hydraulic, and caustic environments where harsh conditions could exist. "These hermetically sealed receptacles can be used in any application where harsh conditions could compromise the operation of electrical equipment. These connectors protect against changes in atmospheric pressure and exposure to humidity, grime, and chemicals," said Larry Howanitz, Vice President, EIS & Sensors, API Technologies. "They are an ideal solution for commercial aerospace and industrial applications, as well as communication systems, military aircraft, and defense armaments." 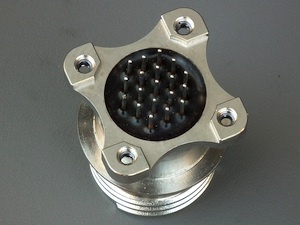 The connector's receptacle has a seal of 10-7 cm3 and comes in filtered and unfiltered versions. They can be utilized in any application where unfiltered custom mechanical variations or filtering are required with a ruggedized seal. API Technologies' Electromagnetic Integrated Solutions (EIS) line of products offers filters and interconnects, advanced ceramics, specialty connectors and harnessing, power filters, and film modules. For additional information, including details on these new hermetically sealed circular connectors, please visit eis.apitech.com. API Technologies designs , develops and manufactures electronic systems, subsystems, RF and secure solutions for technically demanding defense, aerospace and commercial applications. API Technologies' customers include many leading Fortune 500 companies. API Technologies trades on the NASDAQ under the symbol ATNY. For more information, visit www.apitechnologies.com.